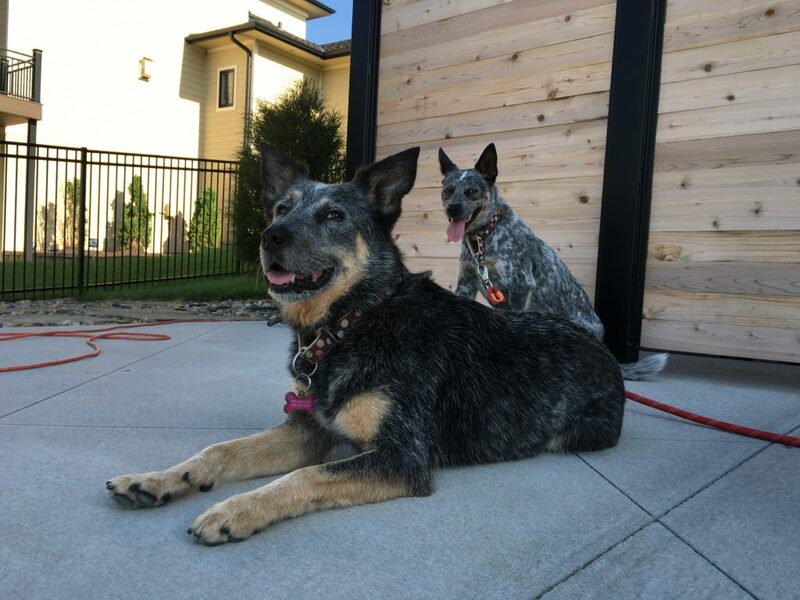 For this session I revisited a pair of deaf Blue Heelers I first worked with two years ago; Artemis (Front) and Sage. The guardians called me back for another dog obedience session to stop Artemis from protesting and trying to block guests who leave as well as Sage’s continued fear around new people. Helping a fearful dog is challenging, but one of the more rewarding parts of my job. It’s quite possible that Sage is the most fearful dog Ive ever met. The fact that she cannot hear makes things more challenging as a number of the techniques that I would normally use to distract her involve sound. Training a deaf dog doesn’t have to be difficult, but it certainly is a different challenge. I did notice a big problem shortly after sitting down with the guardian to discuss the session. I was going out of my way to avoid making eye contact or even looking in Sage’s direction as this caused her to bark and run away. However out of the corner of my eye I did notice the family’s son trying to pet and console her while she was in a fearful and flight-like state. If a dog is in an unbalanced state of mind; fearful, anxious, nervous, etc – and you pet it, you are nurturing the exact thing you are trying to stop. Positive reinforcement or positive dog training only works when the dog is in a calm and balanced state of mind. A better strategy is to distract the dog by throwing a ball, using a laser, going for a walk or engaging with a toy etc. If you can, try to get the dog moving forward. Dogs get over things by literally walking, running or moving in a forward direction. After a brief discussion about how and when to properly pet, we got to work. First up was Artemis’s behavior when guests try to leave. Being a herding breed, I’m guessing that Artemis’s behavior is an attempt to try to control the situation. Most likely to tell the person that they don’t need to leave or that she doesn’t want them to. Dog’s often gets more excited and fired up the more they move around. I did a little leash training to show the guardian how she could use this tool to help her dog settle itself down and maintain control while the guests are leaving. I suggested that the guardians practice this technique every time a guest leaves for the next two weeks. If they practice it enough, they should be able to transition to having the dog on the leash but not holding it. The next step would be to practice moving to the same position on the left of the door and then asking to talk to sit/stay while the guest leaves without a leash at all. It will take some practice, but if the humans are consistent and practice regularly, Artemis should be able to stop the behavior and remain calm at the door without any restraint. Next I went over a counter conditioning technique that the guardians can utilize to stop Artemis’s reaction to seeing sailboats or planes flying overhead. Counterconditioning is a long-term solution, but it does take a little bit more time and effort. It will be important for the guardian to utilize the counterconditioning technique every single time that a boat or any other object outside of the window attracts Artemis’s attention. If they are patient and do not get the dog too close to the stimulus too fast, Artemis should learn to stop behaving this way when she see’s sailboats, planes or anything else that currently cause her to react. I have found that the Watch exercise is a great way to help the dogs develop control and give the guardians a tool that enables them to redirect their dog. I grabbed some high value treats and set out to demonstrate this technique with Artemis. I recommended that the guardian practice the Watch exercise with both dogs, but separately. It will be important that they incorporate a hand signal so that they can redirect the dogs into a watch anytime they are anxious, nervous or overexcited. Throughout the session up till now, I had ignored Sage completely. As a result she had grown more comfortable and was getting closer and closer to us, sort of circling the room. I had hoped that she would come over all the way, but it was clear that this was still just too much for her to process. Because it’s been a couple of years since our last session and Sage has been stuck in this fearful state of mind, I used a more advanced technique that I would usually avoid for this problem; Flooding. Flooding is a process of exposing the dog to something that it is reactive to in a controlled situation under a lower level of stimulation while providing positive reinforcement if possible. The idea is to give the dog time and exposure to whatever it is fearful of in a low intensity so that it can learn to get over or face it’s fears. If the guardians can find suitable candidates to practice this exercise with, Sage should learn to stop being so fearful of people she does not know. It will be very important that the people are calm, quiet, use soft movements and body language and do not try to move too far too fast. Ideally, the humans will monitor the dog closely and look for signs of improved body language. A good indicator is the dog starting to use it nose as well as a body posture that does not look tense. If possible, video recording each flooding experience will help the guardians note the progress they are making with the dog when comparing foot age later. It’s going to likely take multiple exposures to the same person before Sage starts to comprehend that they are not going to do anything other than sit next to her. Once she makes that realization, she will be able to start getting curious about them. But that will only happen once the dog is no longer fearful of the human reaching out or do anything else that she does not want. All we want her to do is simply practice being next to human until she’s comfortable enough to move to the next stage. After flooding Sage, the guardians and I started to discuss exercise. Now this family is much more active and physically fit than most of the clients that I work with. They hike, run, bike and do other outdoor activities on a regular basis and that includes their dogs. So this is not a situation where the dog is not getting the sufficient amount of exercise as I thought during the session. However, while running is great exercise for us, running next to a human is not as good of a workout for a dog as being able to run and pull as fast as they want. I have found one of the best activities to burn excess energy is what I like to call Dogsking. By the end of the session, Sage was able to stay in place while I got within about 15 feet of her. Considering she normally would run to the far side of the room and bark constantly, this was good progress. It’s going to take some concerted effort’s from the members of Sage’s family to help her get over these fears. Number one on the list is to stop petting her anytime she is anxious or nervous. I would also like to see all of the members of the family practicing the Watch exercise with her at least once a day. Just like any other skill, the dogs will get better at it the more they practice it. I also suggested that they start trying to pet the dog for a purpose. By asking Sage to sit or lay down before they pet her, they can help her start to identify more as a follower. I think a big part of Sage’s problem is that she is a dog breed that is designed to be a leader or independent thinker. But in her case, her deafness combined with lower self-esteem and humans not acting like followers is most likely causing her a lot of stress and anxiety. If the humans can help the dog start to identify as a follower, they can remove a lot of this responsibility which should result in a big drop off in the amount of stress she feels. Even something as simple as adding structure to mealtime can go a long ways towards helping Sage adopt the followers mindset that we are looking for. To that end, I showed the guardians how they can change meal time to help in that regard. But in the end, I think that it’s going to be assisting Sage in confronting her fears that finally allows her to get over the hump. Choosing the right people, taking their time and repeating the flooding technique while only increasing its difficulty as the dog shows that it is able to get comfortable will be huge factors in Sage’s rehabilitation. I asked the guardians to follow up with me in one week so that we can monitor the progress that they are making and make any necessary adjustments. It’s clear that both dogs are intelligent so with the right technique, consistency and good timing, we should be able to help Sage learn to stop being so fearful while Artemis learns to stay cool when people leave.